We spent the entire day on US 60 – not as bad as the interstate, but still plenty of trucks and motor homes. It would appear that some of the snowbirds are headed back up north and/or spring break has begun. 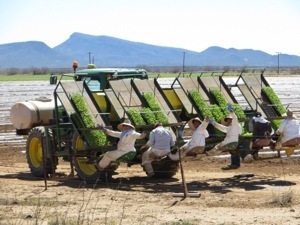 Just outside of Aguila, about 30 miles into the ride, I came across this interesting planting machine. I was able to stop a farm truck and found out they were planting chick peas (garbanzo beans). Further down the road, there was a large group of horse trailers, so I went exploring. 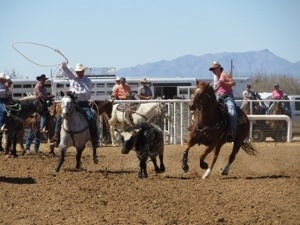 They were having a team roping competition. 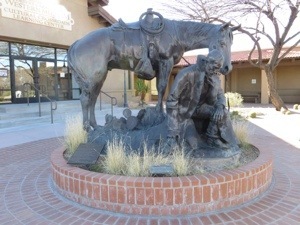 Didn’t linger as I had to make Wickenburg. My Radford friend Jacque Howe Ward has a friend in town who is the librarian. 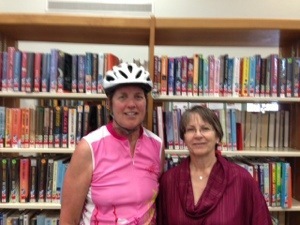 So my first stop in town was at the library to meet Ann Boles. 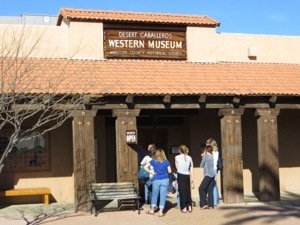 Then, at the recommendation of my friends Warren and Sandy, I headed to the Desert Caballeros Western Museum – a very good collection of cowboy art and artifacts. Warren and Sandy drove out from Phoenix to join me for dinner. Sandy’s chocolate chip bars were a big hit for dessert. And I am most thankful to Warren for installing a new bicycle computer, so I have a running total of my miles each day and cumulatively. My roommate for the night was Mel Brill, a retired firefighter/EMT for Orlando, FL. She is riding a heavy mountain bike with suspension springs. 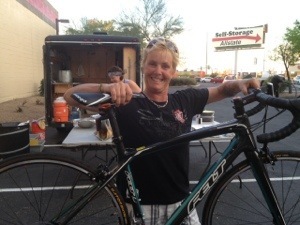 This photo is of her with her new lighter bike, purchased today in Phoenix. Total miles 58, probably faster average than any previous day. We’re enjoying following your trip. The pics are great! Thanks for stopping in to meet Ann. 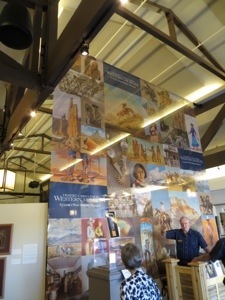 Keep up the great progress, photos & blogging.